Our goal of placing the realization of Roma rights on academic and policy agendas in the United States and elsewhere is achieved through publications, conferences, lectures, and courses. In this work, we join with others arguing for social justice for minorities who have suffered extensive losses over centuries. In our events, we highlight not only an academic perspective, but also celebrate the role of artistic expression throughout Roma history, including into the present day. We foresee a multidisciplinary volume jointly edited by four members of the Harvard faculty: Jacqueline Bhabha, Professor of the Practice of Health and Human Rights; Caroline Elkins, Professor of History; Walter Johnson, Professor of History; and Margareta Matache, Instructor and Director of the Roma Program, at the Harvard FXB Center for Health and Human Rights. Time for reparation? Addressing state responsibility for collective injustice will explore the issue of reparations and restitution comparatively – across a broad range of historical and geographic contexts as well as across academic disciplines. Departing from the presentist bias of much work on social exclusion, our book project aims to challenge stereotypes about the victim status of marginalized groups. We plan to explore the respective roles of social responsibility, solidarity, and community advocacy in probing forgotten collective injustice from the past as a basis for constructing viable strategies for anchoring contemporary claims making. The volume will add and provide a dialog between experts from various geographic locations and will use different and often neglected reparation cases and approaches to contribute to theories and practices in the field. We will address the significant issue of Roma slavery, slave descendants in Guadeloupe, the slavery of people in the Caribbean Islands, as well as sexual violence against Mayan women in Guatemala, the Armenian Genocide, and cases from the more recent British colonial past, including Mau Mau. The volume will not take the validity of reparations as a social justice strategy for granted. Rather we will encourage contributors to engage with contrasting views and with arguments that counter their perspective as much as with those that endorse it, and to make their case for or against reparations. The book follows up on the results of “Responses to State Sponsored Collective Violence” the fourth annual Roma conference at Harvard, organized by Harvard FXB Center. Published by the University of Pennsylvania Press in March 2017, Realizing Roma Rights inquires, from the standpoint of a range of different disciplinary and professional perspectives, why the Roma minority continues to face issues of discrimination and stigmatization, and concomitant deprivations across a range of central socio-economic indicators, including education, child mortality, and poverty. A primary goal of the book was to promote reflection on historical and contemporary Roma marginalization and to correct the invisibility of Roma issues in current social and political theory. Another goal of the book was to contextualize Roma policy formulation and its implementation within a broader governance and accountability discourse. This special section in Harvard’s Health and Human Rights Journal examined the implementation of the right to health in the case of Romani populations across the globe. It will draw attention to ongoing discrimination against the Roma and Roma-related groups in relation to the realization of the right to health. Articles considered access to health among Romani communities across the globe. Guest editors of the special section were Jacqueline Bhabha, Margareta Matache, and Teresa Sordé Martí. The FXB Center for Health and Human Rights will host the Fifth Annual Roma Conference at Harvard University, Culture Beyond Borders: The Roma Contribution, to mark International Roma Day. The event will bring together academic, literary, artistic, and student communities to explore the contributions of the Roma community to global culture, arts, and material production. The Harvard FXB Center has organized an event on International Roma Day for the past four years.. This year, we intend to add a new emphasis to the discussion by documenting and contextualizing Roma creative and artistic achievement across a range of domains. Culture Beyond Borders debuts with “I Declare at My Own Risk,” Alina Șerban’s illuminating and highly acclaimed examination of conflicting identities, social discrimination, and the redemptive force of self-expression. The conference is co-sponsored by the Berklee College of Music and the following departments and centers at Harvard University: The Center for European Studies, The Committee on Ethnicity, Migration, Rights, The Mahindra Humanities Center, The Department of Music, The Provost’s Fund for Interfaculty Collaboration, and the Weatherhead Center for International Affairs. On April 8, 2016 on International Roma Day, Harvard FXB convened this conference as a way to raise awareness of the 500 years Roma people were held in slavery and the limited recognition of their history of oppression along with the absence of reparations for Roma slave descendants. Panelists from South Africa, Jamaica, France, Hungary, and Romania represented groups calling for reparations, such as Cherokee slave descendants, indigenous Maya K’iche women from Guatemala, the African American community in the United States, and the Romani people in Europe. Scholars and activists addressed the legacy and the continuum of injustice, ending with a vision for how to build a culture of peace and social justice. The conference provided an opportunity to explore the issue of collective wrongs comparatively – across historic and geographic regions as well as across academic disciplines. It drew attention, in particular, to the lack of measures to atone for past wrongs committed by states against Roma populations. Harvard FXB organized the conference in partnership with several Harvard departments and centers, the Mahindra Humanities Center; Carr Center for Human Rights Policy; Center for European Studies; Committee on Ethnicity, Migration, Rights; Harvard University Native American Program; Hutchins Center for African & African American Research; and the Harvard Seminar on History and Politics. 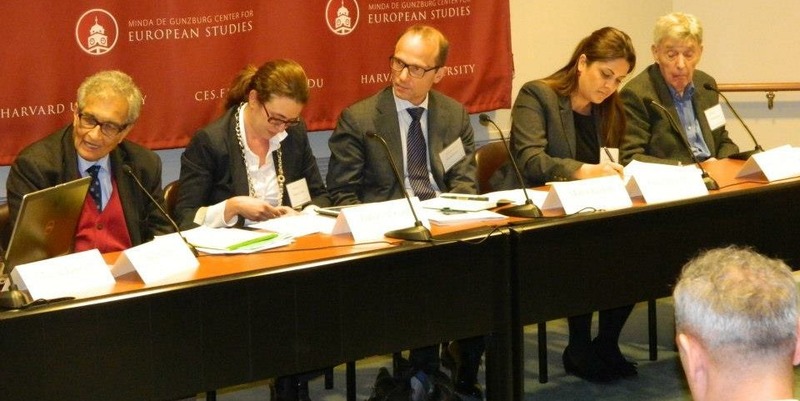 This annual Roma event at Harvard was a joint effort of Harvard’s FXB Center and Center for European Studies in recognition of the International Roma Day. April 8. It featured a discussion between Damian Drăghici, Romani Member of the European Parliament, and Margareta Matache, Instructor at Harvard’s FXB Center. We welcomed Damian Drăghici’s participation, a renowned musician and Roma member of the European Parliament, for a set of robust, critical conversations assessing Europe’s track record in addressing anti-Roma discrimination so far. The event was jointly organized on October 28, 2014, by the Harvard University Native American Program; Francois-Xavier Bagnoud Center for Health and Human Rights, Harvard School of Public Health; Human Rights Program, Harvard Law School; Hutchins Center for African and African American Studies. The core objective of this event was to reflect on the different forms of discrimination encountered by minority/marginalized children in schools in modern US and Europe, sixty years after the ruling of the historic case, Brown v. Board of Education. The discussion reflected on cross-cutting causes and common concerns of marginalization across continents, with a focus on school segregation. It discussed the paths of segregating minority and/or indigenous children in schools and the impacts for children, families, peers and society. Scholars and practitioners representing minority/marginalized groups were invited to advance their analyses on the roots and factors that push discrimination in education and move ahead toward inter-sectorial partnerships. Known as the first Roma conference at Harvard, the “Realizing Roma rights: addressing violence, discrimination and segregation in Europe” conference was organized on April 8, 2013 by the FXB Center for Health and Human Rights, the Mahindra Humanities Center, the Center for European Studies at Harvard University and the OSCE/ODIHR/Contact Point for Roma and Sinti Issues. The conference convened international experts from government, civil society and the academy and an overflow and diverse audience. The discussions involved several well-known academics: Grzegorz Ekiert, Jack Greenberg, Will Guy, Michele Lamont, Kalman Mizsei, Amartya Sen; leading Roma activists and scholars: Dezideriu Gergely, Marian Mandache, Oana Mihalache, Anna Mirga, Iliana Sarafian; and representatives of US and international government institutions: Roberta V. Gatti, Morten Kjaerum, Andrzej Mirga, Erika Schlager, Michael Uyehara. The goal of the conference was to place the realization of Roma rights on academic and policy agendas in the United States and Europe and to generate dialogue on the role of Roma youth in promoting Roma economic, social and political inclusion. The participants addressed two of the most urgent challenges facing the Roma community in Europe: 1) the escalating climate of anti-Roma violence, extremism, and structural discrimination, and 2) the need to strengthen Roma youth agency and leadership. The Nobel prize laureate, Amartya Sen contributed to the conversation by providing insights on how ethnic groups, such as Roma, can build their social and cultural capital, in unwelcoming though economically developed environments and shift dominant historical and contemporary views on the Roma and to address the invisibility of Roma issues in social and political theory. The event concluded with a reception and an exceptional performance by Lulo Reinhardt, a musician born in a Roma family with a legendary and famous music tradition. also, videos of all panels available on Harvard FXB’s YouTube channel. Return to the main page of the Harvard FXB Roma Program.